As we get older we tend to find our party days receding into half-watched Netflix rentals and bed by 10pm. And on the occasion we actually are awake and not just day dreaming about getting a thrill on to spinning lights and pounding beats, there’s the terrible sleep-deprived and probable substance-induced monster we become at seven a.m. when the kids come bouncing into our beds. 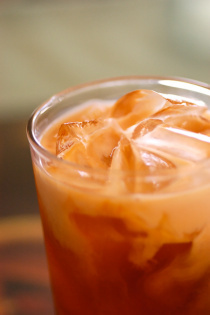 Nightlife dispossessed adult, meet Thai iced tea. My favorite guilty pleasure with little risk of being pulled over. With its deep riverbed red Cha tea infused with sugar and topped with thick layers of cream and condensed milk, it’s an all-nighter without the broken heel and undesired attention. Addicting? Well, I introduced my mother to heaven on ice at a Thai restaurant recently and now she has me shipping Cha leaves to her from L.A. in heat-sealed baggies tucked into empty peanut butter jars.